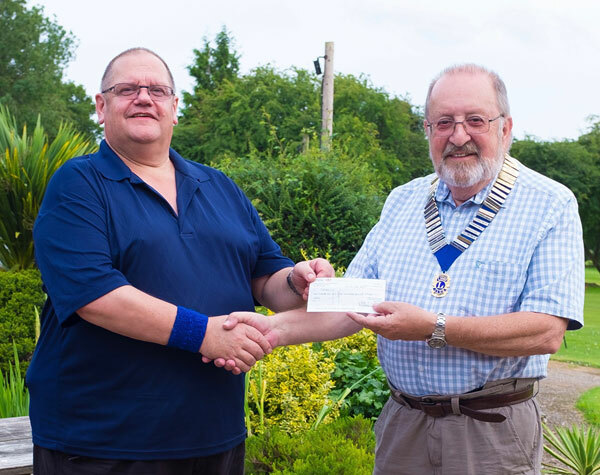 Alton Lions President Mike Gwynne hands over cheque for £2500 to Jon Colville Director of Fund Raising at Treloar’s School and College for Disabled Children. The funds were raised at this year’s ‘Party in the Park’ in June held in the Public Gardens. The Party is a free to enter event organised by Alton Lions Club and opened by Alton Town Mayor Councillor Dean Phillips. This year’s event, not only marked the Centenary of the LIONS organisation, but also the tenth year the ‘Party has been held and was sponsored by Alton Town Council, MolsonCoors, First Exchange and the Newbury Building Society. This year’s Party, which had a Harry Potter theme included with a steam train leaving from platform 9 3/4 together with family entertainment with Mr Magic, Punch & Judy, Balloon Dave, stilt walker Sir Lupin Pipwithers, local band Trip Wire and the return of our own local Elvis. As well as plenty of refreshments the Party had lots of fun activities provided by Alton Lions and other local charities, schools and organisations to raise funds for their own undertakings. Jon expressed his sincerest thanks for Alton Lions for organising the event and said that this year funds would the Assistive Technology Team at Treloar’s. This work is not funded by fees or local government but is vital to the young people at Treloar’s. The Team is responsible for adapting wheelchairs for oxygen bottles, speech computers and other items that enable the children to realise their aims at Treloar’s. This is achieved through student sessions with an Engineer, a Physiotherapist and an Occupational Therapist to develop and implement the most appropriate wheelchair adaptions.